Crepe making takes patience but once you get the hang of it, it’s really satisfying knowing that you have another breakfast item you can whip up. It actually took a few crepe making sessions to get the hang of moving the pan around to get the batter spread nice and thinly all over the base of the pan to produce a thin crepe. I freeze leftover crepes so that tomorrow’s me, can thank today’s me for being that prepared. To prepare the crepe batter, put all the crepe ingredients in a food processor and blend everything together till smooth. I usually pour the batter into a large bowl, cover it and set it aside for 30 minutes to let the batter rest. To prepare the persimmon, melt the butter in a small frying pan over low medium heat and cook it till it starts to brown. Add the sugar and cinnamon and simmer till the sugar dissolves. Place the wedges of persimmon in the frying pan and pan fry on each cut side until the persimmon starts to soften. Remove off the heat and set aside. When you’re ready to cook the crepes. Melt some butter in a small non-stick frying pan or crepe pan over low heat. Wipe the excess away with some paper towel. I usually start with 1/4 cup of batter (it’ll depend on the size of your pan how much batter you use for each crepe). One hand holds the pan handle and rotates the pan whilst the other hand pours the batter. This is not a pancake! You want a thin layer of batter to cover the whole base of the pan. The first crepe like when you cook pancakes, is never great. I don’t coat the pan with butter between every crepe – I do it after every 3-4 crepes. I usually cook the crepe on low heat for 2 minutes and then flip to the other side to cook for another minute. This batter makes 8-12 crepes. 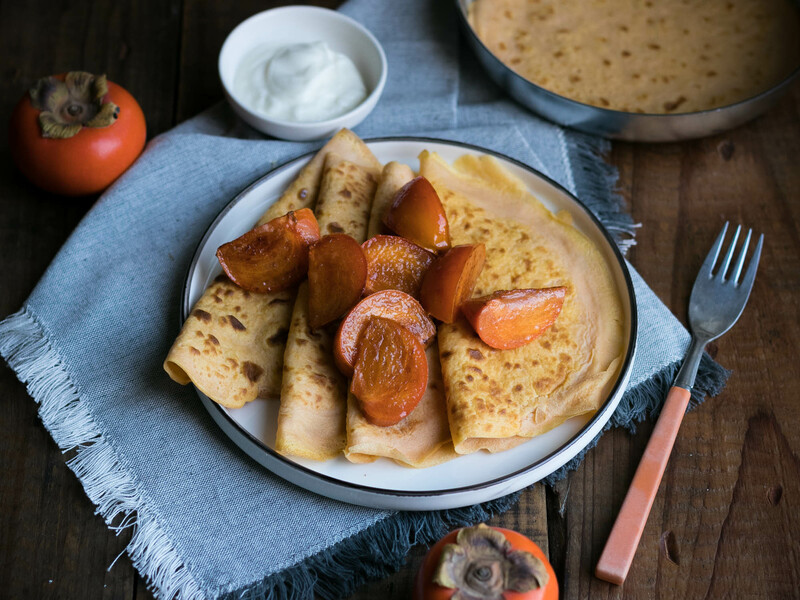 To serve, I top the crepes with pieces of persimmon, Greek yoghurt and sometimes scatter some roasted nuts or toasted coconut shreds.